Many jokes make good hearted fun of men, women, and pets in after life situations. This guide contains Heaven jokes. 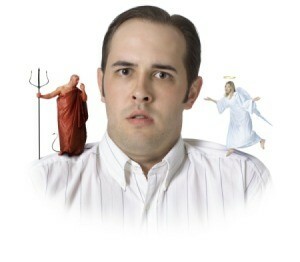 A woman approached the Pearly Gates and was greeted by St. Peter who said, "Before you enter, you must spell a word." "Oh," she said. "What word?" "Any word you like," he told her. She said, "I'll spell Love - L-O-V-E." St. Peter told her she could go in, but asked if she would mind staying there a moment while he went to get something. "What do I do if someone comes?" she asked. "Just tell them to spell a word," St. Peter answered, and left. She stood there only a moment when her husband came into view. She said, "What are you doing here?" and he told her, "I was so distraught at your funeral that when I was driving home, I got into an accident and here I am!" and she said, "Well, you have to spell a word before you can come in." He said, "What word?" and she answered, "Czechoslovakia." am and Edith were 85 years old, and had been married for sixty years. Though they were far from rich, they managed to get by because they watched their pennies. . .
Two ninety year old men, Moe and Sam, have been friends all their lives. It seems that Sam is dying of cancer, and Moe comes to visit him every day. "Sam," says Moe, "You know how we have both loved baseball all our lives, and how we played minor league ball together for so many years. Sam, you have to do me one favor. When you get to Heaven, and I know you will go to Heaven, somehow you've got to let me know if there's baseball in Heaven." Sam looks up at Moe from his death bed, and says, "Moe, you've been my best friend many years. This favor, if it is at all possible, I'll do for you." "Moe, it's me , Sam." I'm telling you," insists the voice. "It's me, Sam!" "Really?" says Moe, "That is fantastic, wonderful beyond my wildest dreams! But, what's the bad news?" Three buddies die in a car crash and they find themselves at an orientation in Heaven. Each man is asked, "When you're lying in your casket & friends and family are mourning, what would you most like to hear them say about you?" The first man says, "I'd like to hear them say that I was a great doctor and a family man." The second man says, "I'd like to hear them say that I was a wonderful husband & school teacher who made a huge difference in children's lives."